Creating customer-focused solutions and increasing automation were the two key themes for Werner Koch Maschinentechnik GmbH at K 2013. A new fully automatic material feed system Navigator was developed as a result. 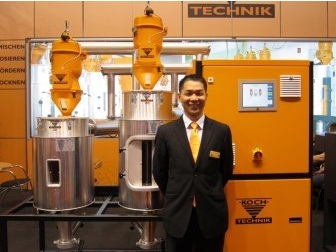 Koch-Technik’s fully automatic material feed system Navigator increases the level of automation in plastics processing. This patented system, which combines flexibility and ease of use, delivers accurate material distribution with zero residue in central conveyor systems, notes the company. Pneumatic sliders automatically move the required material and machine lines together and connect them. The advantage is that the lines do not come into contact with any other material, offering strong protection against contamination and undesired mixing. As said, Navigator can distribute up to 40 different plastics to the processing machines in a single material supply system. The integrated control system allows all the necessary data to be stored and output on standard interfaces. The system is user-friendly with an operating status display and a self-diagnosis option. As an option it can also be integrated in process monitoring visualization software, as supplied by Koch-Technik. Navigator can be easily integrated into existing material supply systems without modifying their basic design. From A to B – but how?